iPod Audio Converter 2.0.0.1 free download. iPod Audio Converter is designed to be a universal iPod Audio file converter, which supports popular audio formats : WAV, MP3, Ogg ,9721, Which convert it to iPod Audio format. This software product was tested thoroughly and was found to contain some third-party components which prevent it from being marked as 100% CLEAN or 100% FREE. Details follow below.ADWARE INCLUDED - you can, however, UNCHECK that ADWARE at installation! The iPod Image Extractor allows you to extract photos from iPod to the PC. SC Audio Converter software represents an universal audio file converter, that will supports all popular audio formats: WAV PCM, MP3 (MPEG Layer-3), WMA (Windows Media Audio), CDA, ALF2, ADPCM, GSM, DSP, A-LAW, U-LAW and Ogg Vorbis. With Free Audio Extractor you will be able to extract audio from your favorite video file and save it to your hard drive in any of the following popular audio formats: WAV PCM, MP3 (MPEG Layer-3), WMA (Windows Media Audio), CDA, ALF2, ADPCM, GSM, DSP, A-LAW, U-LAW and Ogg Vorbis. MobileVideo For iPod is a free video conversion application developed by keronsoft. 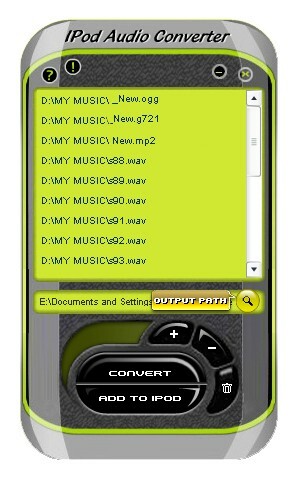 SC MP3-WAV Converter software will make burning custom music CDs a snap. SC Audio CD Creator software represents a must-have software application that will help you to create normal audio CDs from your favorite (MP3, WAV, WMA, OGG) files. ABC Amber Audio Converter is an application which will help you convert wav files to mp3 files (or mp3 files to wav files).